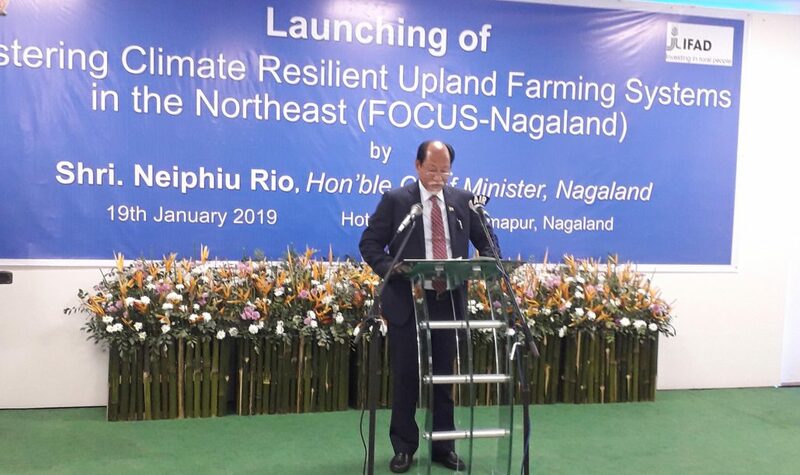 Nagaland Chief Minister Neiphiu Rio on Saturday emphasised on fusion of agri and allied sectors for success of any scheme for farmers in the State. Ngaland CM Rio said fusion of all line departments in making a scheme successful will pay rich dividends to the farmers. Launching the Fostering Climate Resilient Update Farming Systems in the Northeast (FOCUS-Nagaland) project at Hotel Saramati here, Rio appealed to all line departments to join hands and to help farmers in improving their economy and livelihood. FOCUS-Nagaland, a six-year project, is aimed at improving jhum or shifting cultivation in rural areas of the state with a judicious combination of modern scientific knowledge, agricultural technologies and practices in natural resource management as well as the traditional wisdom and adaptive practices of the upland communities, thereby doubling the income of farmers. It also aims to manage practices of shifting cultivation and fallow stages without replacing or eliminating them. “We do not produce on commercial basis. I tell people from other states that we are a consumer state,” Rio said. He also laid special emphasis on providing marketing support for the farmers’ produce while also calling for value addition to it. He asked the FOCUS-Nagaland project team to adopt a holistic approach and implement the project in consultation with the village authorities. “We must make the project a success story as our economy is agriculture based and no Naga is without land,” the Nagaland CM stated. He hoped that the project would help farmers in rescuing them from their economic conditions. Nagaland CM Rio lauded IFAD and its support team for taking up the project in Nagaland for enhancing the livelihood of the farmers through modern technology.